Welcome to the designated page for ‘North East Darts Promotions’. 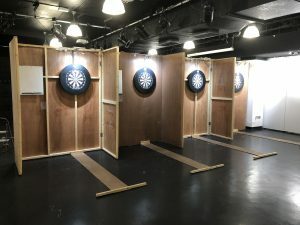 We aim to bring the very best open darts tournaments to the area along with exhibitions, events and more. 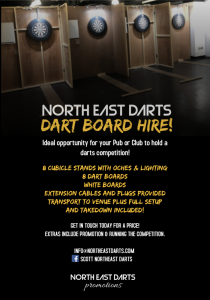 LOOKING TO HIRE DART BOARDS FOR A COMPETITION AT YOUR VENUE? 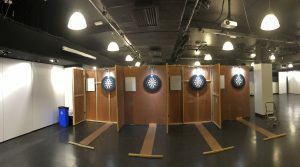 LOOKING TO HOLD A DARTS EXHIBITION AT YOUR VENUE? Join the official Facebook group to receive instant, important updates. Join HERE. To view the latest news from the North East Darting world please select the ‘Home’ page from the menu bar above. Click on the image above for great deals on darts products! Saturday 1st June 2019 – GRAND SLAM PAIRS II – 48 PAIRS – PRIZE FUND TBC! Saturday 3rd August 2019 – Sky Lounge Summer Open – BIG PRIZE FUND TBC! 2nd December 2017 (256 Entries) – £4,500 Prize Fund. 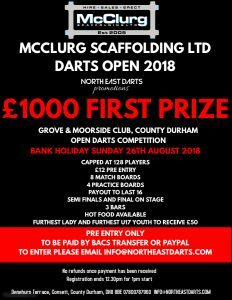 26th August 2018 (100+ Entries) – £2,500 Prize Fund. Saturday December 8th 2018 (16 teams of 4 – Round Robin) – £1,400 Prize Fund. 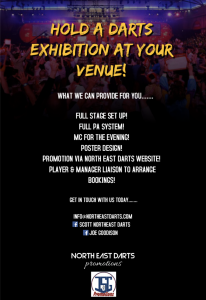 If any company/sole trader would like to become a board sponsor at any North East Darts Promotions events, please email info@northeastdarts.com. • Logo & Details advertised on the day of the event. • Advertised via Facebook Profile, Facebook Page, Twitter and more. Including any logos, website links, contact numbers etc on run up to event. • Advertised on a prime spot on the website on front page. • 25,000 Hits a month! The sooner you get in contact, the longer the advertisement will be online. If you would to support the running of the website to include your company information on our sponsors page along with association throughout the calendar year including social media presence, please get in touch. 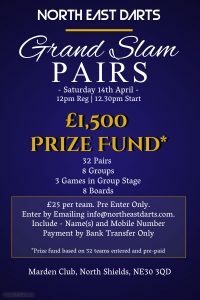 Grand Slam Pairs competition at Marden Club, North Shields on Saturday April 14th. Entry is £25 per team, which works out less than £4.50 per game due to at least 3 games in the group stage! A total of 32 pairs will be broken down into 8 groups, with the top 2 pairs from each group qualifying for the knockout stages. The prize fund will be £1,500 based on 32 pairs pre paid and entered and payout will be down to the last 16. To enter, please email ‘INFO@NORTHEASTDARTS.COM’ with the names of the players and a contact telephone number. You will then be told the details for payment. Payment is Bank Transfer Only and your team is only confirmed once payment is received.